This is #1 of my Top Ten of 2014! This massive tome clocks in at 399 pages, 1 page front cover, 1 page advertisement, 1 page editorial, 2 pages of ToC, 3 pages of short author bios (which should be included in any roleplaying game supplement – seriously, help the talented folk that craft these books get all the recognition they can! ), 1 page advice on how to read statblocks, 1 page SRD, 1 page back cover, leaving us with no less than 388 (!!!) pages of content, making this one of the longest books I’ve ever reviewed, so let’s take a look, shall we? When I reviewed “Shadowed Keep of the Borderlands” and similar adventures by Raging Swan Press (if you haven’t checked these out – get them! ), the one thing that caught my eye the most was the sheer brutal amount of details – you know, terrain features, things to actually do, that rendered them so…alive. Concise. Believable. The details mostly absent from many new-school modules, the level of detail lost in many a module since the 3.X days in favor of long statblocks. Well, the series that spawned from the genius realization that details are important would be the Dressing-lines, which contain some of the most ridiculously useful information for any DM you can find – not only for Pathfinder, but for any system. This is not all that made Raging Swan press modules stand out – remember those dungeons where monsters were placed with neither rhyme, nor reason, wondering how the dragon got into the dungeon etc. – and the annoying rationale “MAGIC!”? Well, this book can be considered the ultimate rebuttal to this type of sloppy design – providing concise information on how to craft intricate dungeons that actually make sense. Basic observations from “Who amde the dungeon?” and “For what purpose?” to former roles it may have had to who actually knows about these tidbits of lore are only the tip of the ice-berg: Considering food and water, access, predators and the like, making good unoccupied rooms that tell stories. Every DM and especially any worldsmith should check these out. Advice on handling a dungeon’s physicality (vertical shafts, terrain threats etc.) are provided alongside special considerations for mega-dungeon design and even alternate dungeon designs (of which one can now find a new series by RSP…) – the advice provided here is presented so concisely, it could be deemed a proper checklist for making good dungeons, one that any DM should take a long, hard look at. 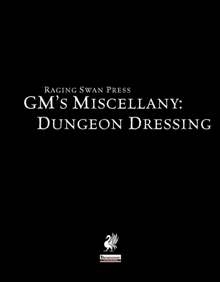 Now you may already know that this book collects the numerous Dungeon Dressing-pdfs in one handy tome – but do you realize the extent of what is in here? The following installments are collected herein: Altars, Archways, Bridges, Captives, Ceilings, Chests, Corpses, Doom Paintings, Doors, Double Doors, Dungeon Entrances, Dungeon names, Fiendish Traps I + II, Floors, Fountains, Gates & Portals, Goblin’s Pockets, Legends I + II, Mundane Chest Contents, Pits, Pools, Portcullises, Sarcophagi, Secret Doors, Simple Magic Traps, Stair, Statues, Tapestries, Thrones, Trapdoors, Walls and Wells. Additionally, the 3 “So what’s the Riddle like, anyways?” are part of the deal and an extensive excerpt from the immensely useful “All that Glimemrs”-compilation has also been provided, sporting a total of 20 treasure hoards at your disposal – after all, dungeons need treasure! Now you probably have seen that one coming – but I have written reviews for ALL OF THE ABOVE. Yeah. Looking at it from my current vantage point, I feel somewhat OCD…be that as it may, you can easily look up all those reviews, so no, I won’t repeat myself and cover all of these again. Even if I did, the resulting review would probably clock in at more than 20 pages, so yeah. What I *do* focus on here would be the new content provided – let’s begin with new Fiendish Traps, shall we? A total of 3 new ones of these nasty, complex traps are provided, making essentially “Fiendish Traps III” a part of the deal here. The first here makes for an exceedingly smart trapped puzzle-lock for an undead (or similar creature’s) lair: Different alcoves contain different skulls, with each skull representing one of the bare necessities of life – hunger, thirst, etc. – in order to open the vault door, all traps have to be triggered at the same time, resulting in magic-induced thirst, famine, suffocation and an attack by an animate dream…Ouch and oh so iconic and cool! The defense-hallway sporting poisonous gas and fetchling snipers is nasty as well, as is the traps that is a variant of the classic endless falls, which also adds a temporal distortion to the whole deal – awesome! Now one of the most overlooked and easiest way to make a dungeon not work is to not get the illumination/sight-question of the inhabitants right. Sans darkvision, inhabitants better have some sort of way to provide for sight – and since this one is also combat-relevant, it will come up – I guaranteed it. Hence, we have one of the most useful DM-cheat-sheets of the whole series in this new chapter, providing everything you need to know in that regard rules-wise at one glance. Want to know how this goes even faster – whether braziers, candelabras (1 page each), fireplaces (2 pages), lanterns, magical lights, torch sconces (all 1 page) – the book actually provides so much variation, you’ll never need to reply with “ehem…there are torches.” ever again – detailed, versatile and downright brilliant, this chapter is glorious in its evocative details, even before the 2 new light-based traps. Now of course, one can note that the topics of the book mentioned above do not cover every potentiality of dungeon exploration or design – hence, the book also covers carpets and rugs, evidence left by previous explorers (foreshadow those hostile NPC-groups! ), grafitti,, junk and rubbish, mirrors, eeerie atmospheres (!!! ), clothes and possessions, strange magical affects, strange smells, strange sounds, specialized priest’s and wizard’s chests, provisions, mirrors, odds and sundries, clothes and miscellaneous possessions and YES! LOCKS! The oversight of all door-pdfs now receive their own table! Each of these new tables is at least one page strong, with several covering 2 pages and the locks coming with DC/cost/quality-cheat-sheet mini-table. Wow. Just wow. It should be noted that, for your convenience, the book also provides 2 pages of index for traps by CR ( with the CR covering the range from None to 15 and providing page numbers) and statblocks by CR (ranging from 1/2 to 9, also with page numbers) for easier navigation. Editing and formatting are thoroughly impressive – I have seldom seen a book of this size with this high quality in these two regards – top-notch and awesome. Layout adheres to Raging Swan Press’ two-column b/w-standard and the pdf can be considered printer-friendly. Artwork is fitting b/w and the pdf comes in two versions, one to be printed out and one for screen use. But unless you went full-blown tablet, I’d suggest you get the gorgeous hardcover – I have it and its binding is professional and both paper and glossy cover make this tome a beauty of elegance indeed. The authors Ben Armitage, Alexander Augunas, Aaron Bailey, John Bennett, Creighton Broadhurst, Jeff Erwin, James Graham, Brian Gregory, Eric Hindley, Ben Kent, Thomas King, Greg Marks, Andrew J. Martin, Jacob W. Michaels, Julian Neale, Chad Perrin, David Posener, Brian Ratcliff, Pierre van Rooden, Liz Smith, Josh Vogt, Mike Welham can be proud indeed – why? Because this book is a milestone. I’m not engaging in hyperbole when I say that this belongs in the arsenal of every DM – period. I had the individual pdfs before and I used them – quite extensively, mind you, but this is something different. Sit down with it and start rolling – in less than 30 minutes you’ll have an extremely detailed dungeon at your fingertips, with players not realizing that the complex you created not stemming from a professional module, but from your pen. That is, they may realize it, since this book renders your dungeons memorable, awesome and makes SENSE. Much like the superb “Wilderness Dressing”-book, the organization in this tome is one of the subtle, yet downright brilliant components – the arrangement of the components may be neat – but there’s something apart from that which makes this work so much better than its component pdfs. Beyond collecting all in one handy tome, this book eliminates the small blank spaces left by the component pdfs – the small odds and ends, the carpets, the locks – what has been missing before now is simply there. Another scenario – you’ve bought a module and like the dungeon, but it feels sterile, perhaps due to page-count not sufficing? Use this book and in less than 10 minutes, you’ll potentially have a dungeons your players will talk about for years to come. I’ve beaten around the bush long enough – not only for Pathfinder, but for just about any fantasy-system, this massive book is a godsend. If you have a dungeon, you need this book – it’s simple as that. I’ve been using it in my game ever since I got my greedy hands on it and the sheer massive amount of content and awesomeness in this book is enough to make dungeons feel alive once again. Yes, not all components are super-duper-mega-awesome, but that fact remains that the majority *is* just that – and that the sum here is so much more than its component parts. I’m running out of superlatives fast – so let’s end this -this book is a must-have. One of the most useful books I’ve ever had the pleasure to review. If you don’t have this book, it’s high time you’ll add it to your library. I guarantee that you’ll love this – and if that’s not enough, Raging Swan Press does have a money back guarantee if you’re not satisfied. This book is a hot contender for the number 1 spot of my Top Ten of 2014. My final verdict is 5 stars + seal of approval – the maximum of my scale and had I any other scale, it would score that high still. This book henceforth also is part of the books I consider essential for any campaign – hence, it receives the “EZG Essential”-descriptor. This must-have book, this monument, can be bought here on OBS or here on d20pfsrd.com’s shop. Got this the day it was released and really love it. I was inspired by reading this review today to dig it out and just roll up a random dungeon. Ended up with a really usable deserted unholy fane lying beneath a deserted cathedral which I’m going to enjoy running at some point. Awesome book.